As part of a redesign we’re working on a refresh of many of Papyrs’ screens. One of the updated screens is the Pages overview, where you can quickly find all pages you can access on your Papyrs intranet wiki site. 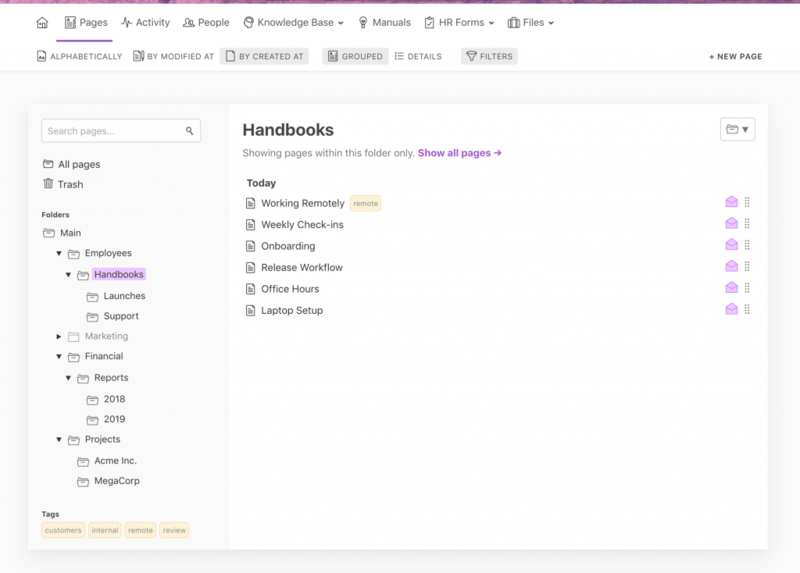 Next to a visual refresh, the new overview makes it easier to search, filter, browse, and reorganize pages. Some sites have already been upgraded to the new pages overview, and we’ll be rolling it out to other accounts soon. This entry was posted in New Features on April 15, 2019 by wim. Another redesign which we’ve made available to all sites now is an update to the settings screen. 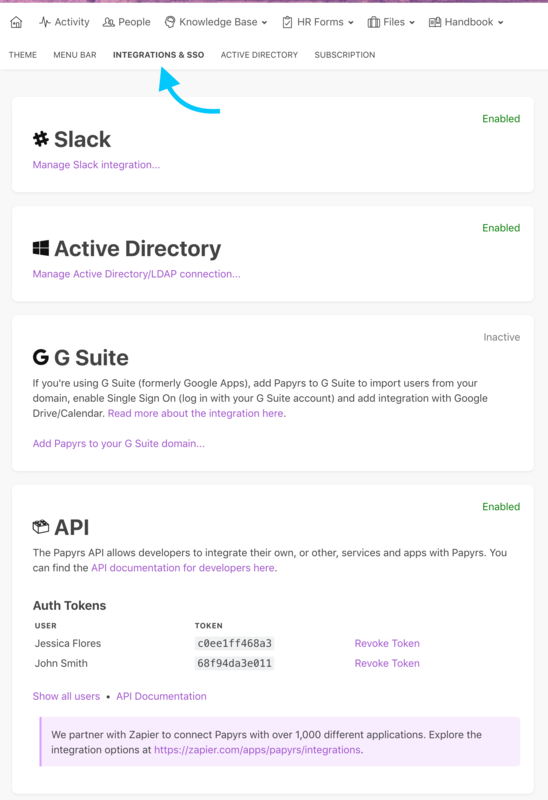 Besides a visual refresh, one goal in particular for the new design was to make it easier to get an overview of all integrations. This way Administrators can enable and access configuration options with just a few clicks (like setting up single sign on with Slack, for example). We hope you find it useful, more design updates soon! This entry was posted in New Features on January 23, 2019 by wim. We’ve been busy redesigning many screens and dialogs over the past few months. Some of these changes will be launched later and we look forward to sharing all updates soon. A few of these updates we’ve already launched, like a design refresh of user profiles. 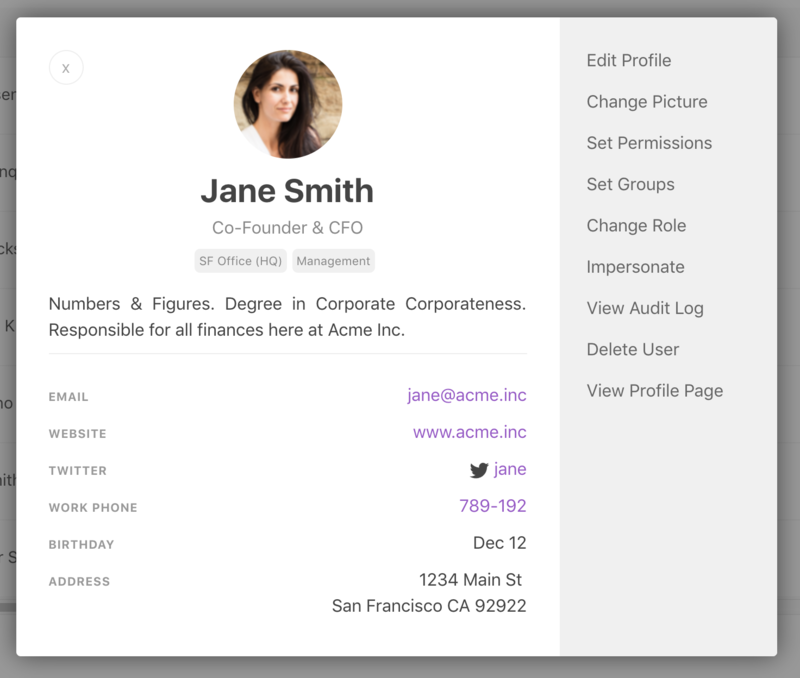 On a Papyrs site, each user has a profile card which people can use to look up more information about a team member (such as their status, position, expertise, and so on). 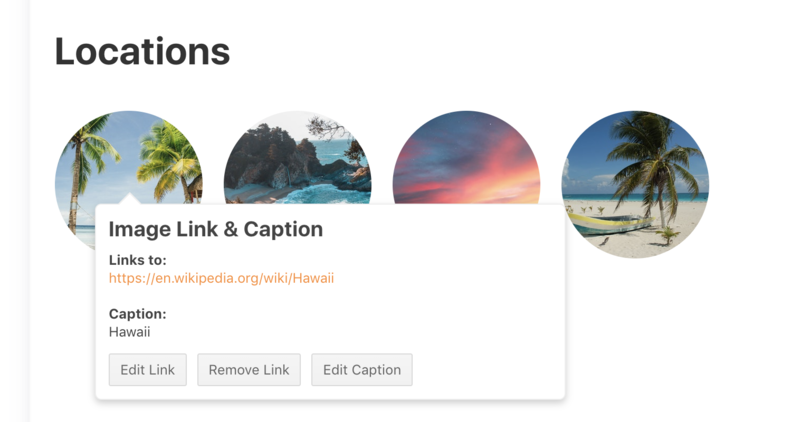 With the new design, clicking on a user anywhere in the interface will bring up a new profile card, making it easier to quickly look up the details of the author of a page, or someone in the People directory, for example. Administrators can also access all user-related options from this profile card. This entry was posted in New Features on December 20, 2018 by wim. We’ve released a number of updates today to the editor and dropdown menus. The new menus should make it easier and faster to access page editing options. To simplify things further, we’ve also split up the old “Page Settings” dialog. 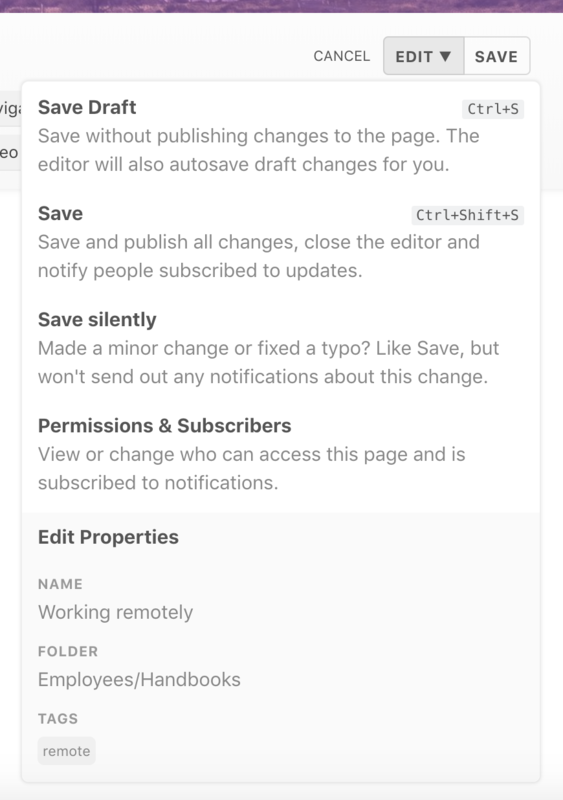 Page Settings are now split up into “Permissions & Subscriptions”, and “Page Properties”. Page properties is where you can change the name of the page, put it in a different folder, assign tags and so on. You can now also access both screens while editing the contents of the page. We hope you find these updates useful. Stay tuned for more! This entry was posted in New Features on November 16, 2018 by wim. 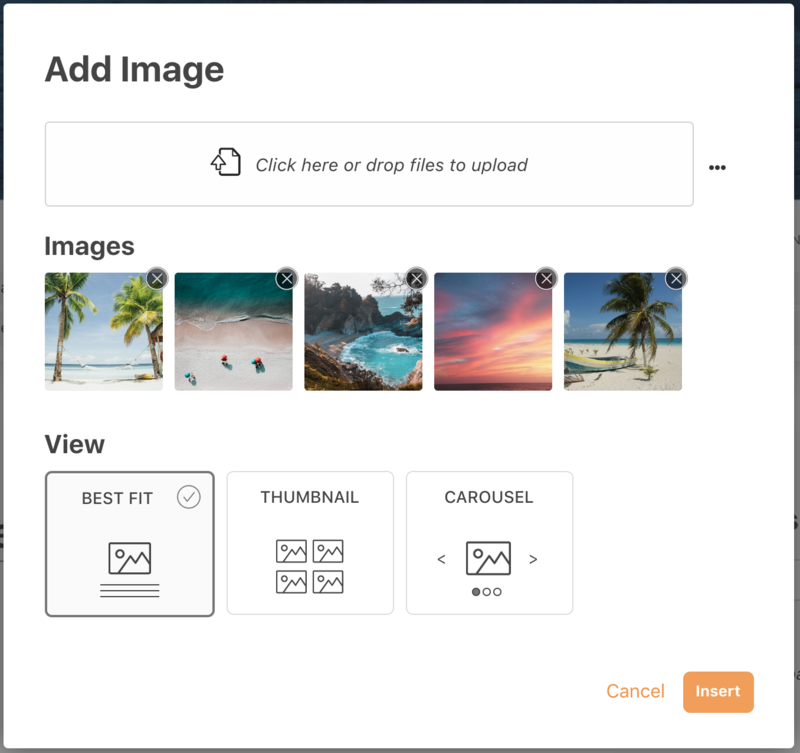 One of the updates we’ve released this month makes it easier to add and edit image galleries. The updated dialog includes a new option which will automatically adjust the images so they fit best on your page. These are just some of the updates we’ve been working on, more is coming soon! This entry was posted in New Features on October 26, 2018 by wim. Any questions about Papyrs? Happy to help! Contact us, and we'll get back to you as soon as possible. We'd love to hear from you and help you with any questions! You can contact our team at team@papyrs.com, or use the contact form. Also see our Help & Support pages and the Frequently Asked Questions.